In a bowl wash the mung beans thoroughly. Pick out and discard any bad-shaped beans and little stones then soak them for at least 3 hours before cooking. It's best to let the beans soak overnight. 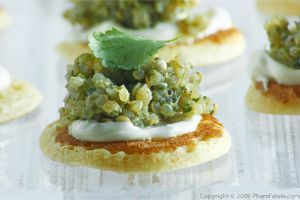 Place the mung beans in a sauce pan, cover with water and bring to a boil, then lower to medium low heat for 20 minutes. The beans should be soft and tender. Set aside. Cut the piece of tofu into 1/4 to 1/2 inch even slices. Pour the oil in a big pan, add the sliced serrano peppers and cook until they soften. 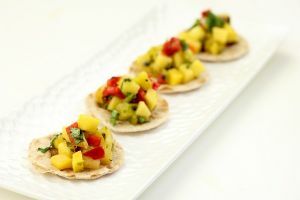 Remove the pepper slices from the pan and set aside in a plate. The reason for cooking the serrano peper first is to provide a nice aroma to the oil. Pan fry the slices until slightly golden. Don't overcook the pieces or they'll start to get hard. Transfer all the tofu to a paper towel and let it cool down. Cut the pieces of tofu into very thin slices. Set aside on a plate. In another bowl, whisk the flours together with coconut milk and water. Add the turmeric, sugar, curry and scallions. Season with 1 teaspoon of salt and pepper. The flour should be stirred up well. Make sure there are no lumps. Add 2 tablespoons of oil. Let the batter stand for at least 1 hour in a cool place. You can keep the batter in the refrigerator up 2-3 days. In a fry pan or a skillet, heat 2 tablespoons of oil over high heat. Add the slices of onions and shallots, the shredded tofu, the slices of shitake mushrooms and the enoki mushrooms. Stir fry for about 2 -3 minutes. Salt and pepper. Transfer to a plate. Set aside. Stir the rice flour batter and ladle 1/3 cup of it into the pan. Tilt the pan to distribute the batter evenly. Keep the heat high. Cover when the edges start to dry a little, and cook until the sides of the crepe turn deep brown and curl up, about 3-4 minutes. 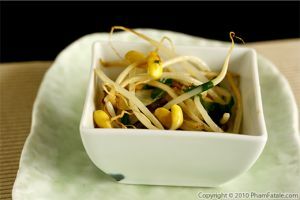 Spoon some mung beans and the mushroom mixture and place a few bean sprouts onto the banh xeo. Cover for another couple of minutes. 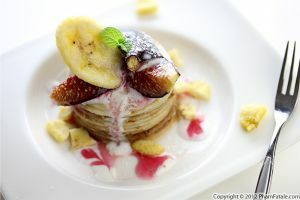 Fold it in half using a wide spatula and slide it onto a warm plate. Wipe pan clean with a paper towl and repeat the same procedure. 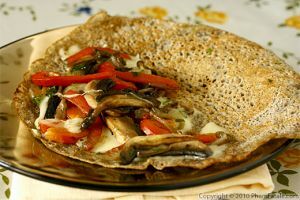 Pour a little more oil into the pan before beginning the next crepe. 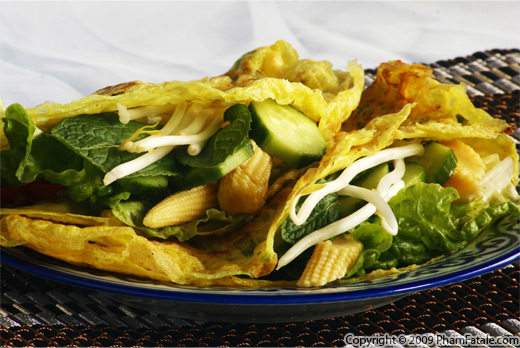 Serve the banh xeo with a nước chấm sauce on the side. You can eat it wrapped in lettuce filled with basil and mint or just simply plain. You can make a meat version by adding sauteed shrimp and beef loin. You can buy rice flour at the stores. I prefer grinding my own though. I know all the nutrients are preserved. I use the Nutrimill brand mill. I got it several months ago and it's very useful to make any kind of flour. It's a great complement for gluten allergies as well. I make my own flour with buckwheat, oat, sorghum and spelt. I absolutely love the Thanh Son tofu brand. If you live in the Bay Area, you have to try it. 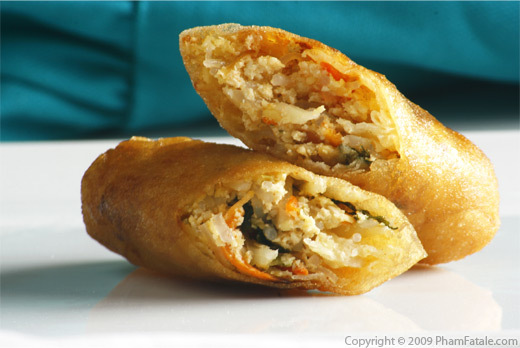 They sell in almost all the Asian markets in downtown San Jose and their main shop is on 2857 Senter Road, San Jose. It's a very little shop but everything is very good. Their factory makes the best tofu texture. This is the perfect place for vegetarians. I always get 2 to 3 pieces of fresh tofu every week. I also recommend to try their fried mushroom tofu cubes as well. They also serve other foods, it's very authentic. You can find cans of pickled garlic (which is quite mild) at any Asian stores. 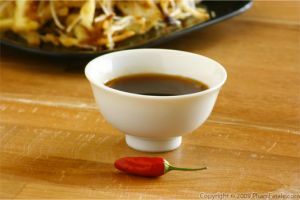 The dipping soy sauce (nước chấm in Vietnamese) is very easy. 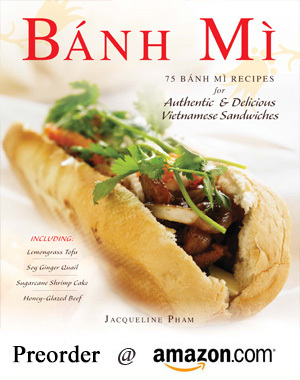 Published By: Jacqueline Pham on February 15, 2009.
wow that just look delicious and it's making me hungry! 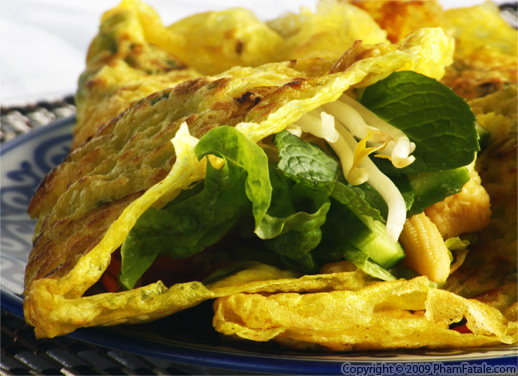 Banh Xeo is one of my favorite dishes and for some odd reason, I've never tried it at home! on a side note, we have so many similarities! I was also born in Paris, my parents moved there in the 60s. I also live in the bay area, love to eat and cook for my half Japanese husband and my indian buddies! Just wanted to say congratulations on a great website. I stumbled onto it accidentally today & just keep going from one great recipe to another, can't stop!.. I don't even know how to cook but everything I read is making me wanna try!